This garden was constructed on the top of a rocky outcrop in Townsville, North Queensland, which is part of the ‘Dry Tropics region’ and a challenging area to create a lush tropical garden which would complement the building. 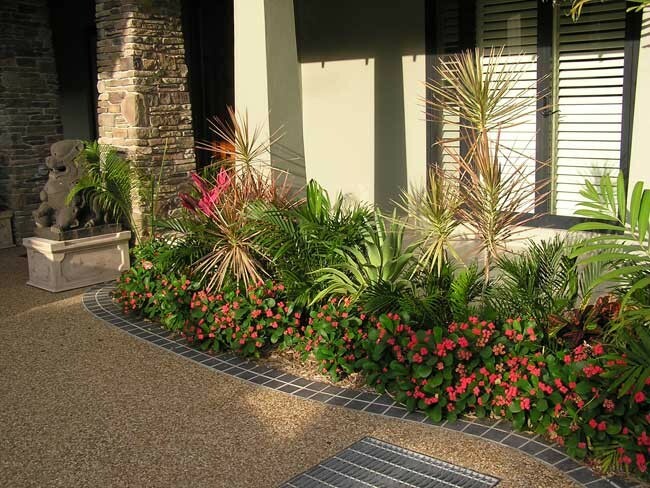 The owner is a dedicated and keen gardener who is happy to keep adding to the plant palette and challenges of caring for a garden of this style. The project expanded onto the adjoining hill, building planting shelves within the rocks and is now a well-known landmark in the area. This garden is constantly developing which gives us a chance to experiment with plants that may not normally survive in such harsh conditions. It was a very hands-on project with staff from the client’s other business brought in to help us plant. At the owner’s request plants were placed at much closer centres than is normal to give the appearance of a finished garden at completion. The garden design brief included the driveway, gatehouse and walls and using the owner’s extensive collection of Balinese artworks within the spaces.